A gorgeous 1.01 carat Fancy Deep Purple Pink diamond ring. 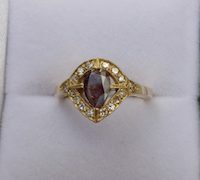 This stone is just above 1 carat, and made into a beautiful modified pear cut. The cutter did a wonderful job creating elongated facets in the table to maximize the color saturation and brilliance in the diamond. Small ‘melee’ stones dot the setting and help draw your eye to the stunning dark plum like color. Pink diamonds are among some of the arrest diamonds in the world. Even small half and quarter carat pink diamonds are coveted. Larger pinks such as this are highly sought after, and can be very difficult to source. This is especially true going forward as the Argyle mine is reaching the end of it’s production life. With it’s closure, we lose the major producer of the worlds pink diamonds. This will make sourcing pink diamonds extremely difficult in the future. Wise collectors know this and are purchasing pink diamonds when and where they can, while they can.